Paul McClure, popularly known as 'The Rutland Troubadour' has a warm expressive vocal style and is a tremendously talented songwriter whose literate songs don't only repay careful listening for the poeticism but include some hugely catchy melodies. In a nutshell, when you also take into account the variety of tempos and sentiments, there is little more the record buying public could or should want! Stylistically he is an artist who defies pigeon holing, although there is often a folksy feel or a country edge, even an occasional bluesiness, in fact I think I even detected an occasional late 1950s to early 60s Rock 'n' roll element that crept in, although none of those styles are particularly dominant. He would probably say if asked that he writes the songs as they come to him without any thoughts of genre, ultimately making him a quite original and highly individual artist. In some ways thanks to the generic ambivalence it would be easy to imagine many of the songs catching on if performed by some of the 'more believable' chart artists, irrespective of the genre that applied to them. This, to my knowledge, is Paul's fourth solo album as well as having put out a band album when he worked for four and a half years with The Hi and Lo. There is so much maturity and confidence in every aspect of this excellent recording, something that anyone who has seen him perform live will be unsurprised to read. 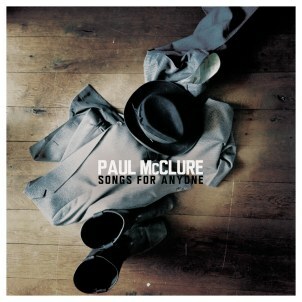 This album in many ways sums up Paul on stage; the high quality songs, an easy going vocal confidence and an all round performance that has something for everyone who appreciates quality 'popular' music. I deliberately veered away from calling it pop music, simply because 'pop' is a word that in many ways defines the 'here today and gone tomorrow recordings. Paul McClure is much better than that and I suspect anyone with a copy of this excellent recording will still be playing it long after the next manufactured 'pop star' has been forgotten. I reviewed his previous excellent album, 'Smiling from the floor up,' on this website and in many ways this review repeats much of what I said about that recording. That doesn't mean this is the same as its predecessor, quite far from it in fact; it is more a question of a consistent quality, with this new recording varying tempos a little more and generally having a fuller, more rounded sound. In fact, I don't know how much thought was given to the album's title, 'Songs for anyone,' but there can have been very few recordings with a more appropriate name. The songs themselves on this excellent album range from spirited upbeat tales to slow moody sparse ballads, all of which leave an indelible imprint on the listener's senses and in most cases create difficult to shift ear worms! Whilst it is not a concept album as such, the songs are all rooted in 'love,' some wistful and pleading, some thankful, even reflecting on love that has waned but all showing a strong maturity and exhibiting an appealing lightness of touch. The album is beautifully produced by talented multi instrumentalist Joe Bennett of The Dreaming Spires, a man who obviously knows Paul and his music well enough to help coax the best out of every song without the need to alter in any way Paul's warm vocal style. Talking of vocals, Redland Palomino Company's Hannah Elton-Wall adds more than just her beautiful feminine harmonies, helping to provide more texture, depth and drama to some excellent songs. The album gets under way with Gentleman's Agreement a lovely easy going love song, with a tremendous instrumentation that includes an unusual steel guitar sound with Paul's evocative vocal perfectly complemented by Hannah Elton-Wall's lovely female harmonies. I Could Be A Happy Man is an easy rolling feel good song that is beautifully written, arranged and performed. It includes the support of a banjo on a casually relaxed tale with nice harmonies and a throbbing bass on a composition that often has the feel of a high quality sing-a-long, enhancing, as most songs on the album do, the diversity of song styles that are all bound together by the lead and harmony vocals. Every day Is Mine To Spend is a lovely ballad, this one quite sparse with just guitar for backing but accompanied by Hannah's gorgeous harmonies on a love song that gradually takes on the mantle of a duet. Lady Flossington is an unusual, but most welcome, song for the modern day that quite authentically harks back to 'pop music' of five or six decades ago! Finally, So Long is another duet ballad with Hannah, on a slow moody tale that reflects on a love that has perhaps become too comfortable and taken for granted. In many ways, at least to me, this rewarding album is a throwback to the days when there were very few genres in 'popular' music. Most recordings borrowed from the few styles that were recognizable, such as 'country and western,' 'Jazz' and 'race music' but other than that the music was either good or bad. This one is very, very good.